Grains and cereals make up this group. Grains are required at breakfast, lunch and supper. Grains may also be served as one of the components at snack. Be whole grain or enriched, or made from whole-corn meal and/or flour. At least 1 serving of grains per day must be whole-grain rich. at least 50% whole grains and the remaining grains in the food are enriched. Grain-based desserts no longer credit toward a reimbursable meal. These items include: cakes, cookies, bars, brownies, pastries, doughnuts, vanilla wafers, cinnamon/caramel rolls, pop tarts, cereal bars, granola bars, rice krispie bars, etc. Breakfast cereals include ready-to-eat, instant, and regular hot cereals. Breakfast cereals must contain no more than 6 grams of sugar per dry oz (no more than 32 grams of sucrose and other sugars per 100 grams of dry cereal). Choose breakfast cereals from the WIC approved list. 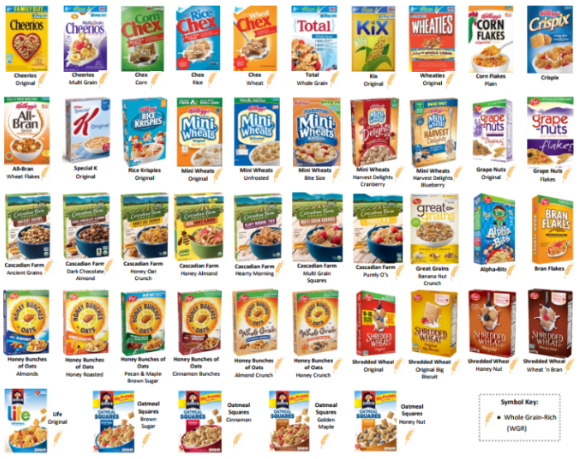 For a printable list of these cereals, click here.